Two decades after Nigerian writer Ken Saro-Wiwa was hanged with eight colleagues for opposing the oil industry’s activities in Ogoniland, his death has been commemorated by Maynooth University with a postgraduate award in his name. 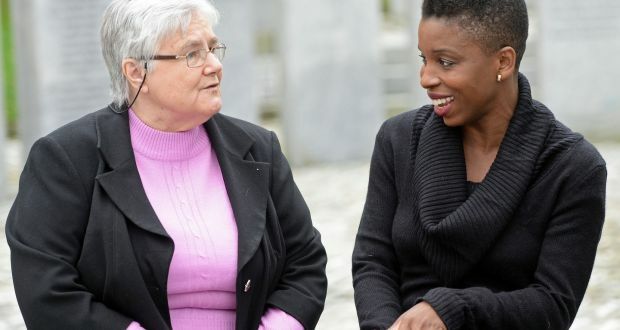 The award, presented to PhD student Graham Kay at the university by Saro-Wiwa’s daughter, British-Nigerian author and journalist Noo Saro-Wiwa, has been funded from sales of a book of his letters to Irish nun Sr Majella McCarron. “Energising” and “moving” was how Ms Saro-Wiwa described reading some of her father’s writing in the letters, when she paid her first visit to the university library before the award ceremony. The library holds an archive of her father’s writings, along with photographs, video recordings and articles. Ms Saro-Wiwa also met Sr McCarron, who had donated the 28 letters and 27 poems to Maynooth University. Sr McCarron first met Mr Saro-Wiwa in 1993 when she was lecturing at the University of Lagos in Nigeria. Recalling activism at that time, Sr McCarron paid tribute to the role of two individuals in Ireland: Niall Toibín of Trócaire and Seán MacConnell, the former Irish Times agriculture correspondent. “I was back in Ireland and had been given a leaked copy of a Nigerian army document which proposed a course of action to suppress the Ogoni people, whose opposition had forced Shell to pull out of Ogoniland,”she said. The document, dated May 12th, 1994, was signed by a senior Nigerian army officer. “I looked up The Irish Times in the Golden Pages, and the reporter I met was Seán MacConnell,”she said. A report by Mr MacConnell, published on January 16th, 1995, included a warning from Sr McCarron that Mr Saro-Wiwa would be subjected to a “mock trial” and killed by the military. In the report, Shell International denied it was “funding in any way military activities in Ogoniland”. Subsequent UN Environment Programme and Amnesty International reports on the environmental degradation of Ogoniland vindicated the so-called Ogoni nine, Sr McCarron said at the ceremony. Maynooth University sociology lecturer Dr Laurence Cox said conflict continued in Ogoniland over implementation of an environmental clean-up, and noted the links between the situation in the Niger delta and handling of the Corrib gas project in Co Mayo.